Within an article looking ahead to the Warriors‘ offseason plans, ESPN’s Brian Windhorst cites sources who say that the franchise is internally projecting a nine-figure increase in revenue when it moves to the Chase Center in San Francisco next season. In other words, Golden State won’t hesitate to re-sign Kevin Durant and Klay Thompson to lucrative new deals even if it pushes the club way into luxury-tax territory for the next few years. Of course, while Thompson is considered a strong bet to stick with the Warriors, there’s no guarantee that Durant will follow suit, so Windhorst’s article focuses in large part on what the front office’s Plan B will be if Durant signs elsewhere. As Windhorst outlines, retaining Thompson is a must in that scenario, and it might make sense for the Dubs to take a long look at Draymond Green‘s future. Green will be eligible for free agency in 2020 and will likely be seeking a substantial raise, so Golden State may want to decide in advance whether it makes sense to invest in him long-term. DeMarcus Cousins remains on track to make his Warriors debut this Friday in Los Angeles, head coach Steve Kerr confirmed on Tuesday (Twitter link via Anthony Slater of The Athletic). Cousins is expected to immediately slide into the starting lineup at the five upon his return from an Achilles tear. After the Warriors lost Patrick McCaw to the Cavaliers – and then the Raptors – Marcus Thompson II of The Athletic took a deep dive into McCaw’s time in Oakland to try to pin down exactly why the young wing wanted to leave. According to Thompson, the first issue that harmed McCaw’s trust in the Warriors was when they brought in Nick Young during 2017’s free agent period and declared an open competition for the backup shooting guard spot, since he felt he had earned those minutes with his play in 2016/17. JANUARY 10: Patrick McCaw has officially signed his one-year contract with the Raptors, according to the NBA’s transactions log. McCaw was waived by the Cavaliers on Monday, allowing him to enter unrestricted free agency and sign with any team. JANUARY 9: Shooting guard Patrick McCaw will sign with the Raptors, tweets ESPN’s Adrian Wojnarowski. McCaw, who cleared waivers today, will receive a one-year deal worth $786K, the pro-rated amount of the veterans’ minimum, according to Shams Charania of The Athletic (Twitter link). The signing will end an eventful two-week odyssey for McCaw that will eventually leave him right where he started. Because he is set to sign a one-year contract, he will become a restricted free agent again at the end of the season if the Raptors submit a qualifying offer, and the team will be able to match any offer he receives. McCaw had been waiting for a contract since July, but nothing materialized until December 28 when the Cavaliers signed him to a non-guaranteed offer sheet worth $6MM over two years. The Warriors elected not to match, sending him to Cleveland, but only for a few days. The Cavs waived McCaw on Sunday, paying him about $323K for his brief stay with the team. The NBA plans to review the unusual way that Cleveland handled the McCaw situation. There are accusations that the Cavaliers circumvented the salary cap, signing McCaw only so he could have a path toward unrestricted free agency with no intention of keeping him. The franchise faces fines or a loss of draft picks if the league determines something inappropriate happened. McCaw played just three games during his time in Cleveland, averaging 1.7 PPG. The expected signing will bring Toronto back to the league minimum of 14 players and increase the team’s projected luxury tax bill by $2.56MM to $34.74MM, according to ESPN’s Bobby Marks (Twitter link). The bill was at $34.5MM before Lorenzo Brown was waived on Monday. The NBA will speak to representatives for Patrick McCaw tomorrow as part of its investigation into whether the Cavaliers acted improperly in signing him to a non-guaranteed offer sheet and waiving him shortly afterward, writes Mark Medina of The San Jose Mercury News. McCaw spent barely a week with Cleveland and appeared in three games after agreeing to a two-year, $6MM offer sheet that the Warriors elected not to match. Cleveland didn’t guarantee any money in the offer, so the club was only on the hook for about $323K. The decision to release him a day before this season’s $3MM salary would have guaranteed led to accusations that the Cavs only gave McCaw the offer as a way to make him an unrestricted free agent and give him a way out of Golden State. Shortly after clearing waivers today, McCaw agreed to join the Raptors on a veteran’s minimum contract for the rest of the season. His representatives contacted about eight other teams before settling on the deal with Toronto, according to Medina. The Cavaliers face severe penalties, including fines and possible loss of draft picks, if the league determines they violated the collective bargaining agreement. However, their recent roster chaos gives them a strong defense, contends Joe Vardon of The Athletic. Cleveland had just nine healthy players on December 28 when it extended the offer sheet to McCaw. One of the starters that night was two-way player Jaron Blossomgame, while fellow two-way player Jalen Jones was on the bench. The Cavs needed extra wing players because Rodney Hood was sidelined with Achilles soreness and David Nwaba was out with lower leg injuries. During McCaw’s first game in Cleveland, Matthew Dellavedova was injured while stepping on another player’s foot, leaving the team without a backup point guard. The Cavaliers bolstered that position by waiving McCaw and signing former Bull Cameron Payne. Vardon adds that under the circumstances, it would be difficult to build a strong case against the franchise unless McCaw or agent Bill Duffy admits that an under-the-table agreement was in place. The NBA plans on formally reviewing the Cavaliers‘ signing and waiving of Patrick McCaw for possible salary cap circumvention, Mark Stein of The New York Times reports. McCaw was a restricted free agent sitting under Warriors team control through most of the season as he sat out and waited for an offer from a rival club. The Cavaliers presented him with a two-year, $6MM offer sheet, which was non-guaranteed, and Golden State chose not to match it, leaving McCaw to join Cleveland. The swingman was with the team less than a week before he was released, and some around the league suspect the move was designed to help McCaw get out from under the Warriors’ control rather than the Cavaliers actually wanting him on the team. Stein adds that the Warriors requested the investigation. Stein notes that NBA teams are not allowed to make “unauthorized agreements” based on “expressed or implied” deals or include “promises, undertakings, representations, commitments, inducements, assurances of intent, or understandings of any kind” with respect to player contracts. Penalties can include fines in the $3-6MM range and could cost a team draft picks. The Cavs have expressed interest in re-signing McCaw to a cheaper deal if he clears waivers. He made roughly $323K during his brief stint in Cleveland. “About four” teams are interested in acquiring Patrick McCaw, who was waived by the Cavaliers yesterday, a source tells Mark Medina of The San Jose Mercury News. Cleveland is believed to be among that group, although some playoff contenders have expressed interest as well. The source isn’t clear on whether any team intends to claim McCaw off waivers or if they will all wait for him to become an unrestricted free agent. Anyone who claims McCaw would inherit the two-year, $6MM contract he signed with Cleveland last week, but the current season would become fully guaranteed. The Cavs’ deal with McCaw turned out to be a way to get him out of his commitment to Golden State. As the final remaining restricted free agent, any offer that McCaw received could have been matched by the Warriors. By signing him to a non-guaranteed deal, Cleveland gave him a path to unrestricted free agency with a minimal financial commitment. McCaw played just three games for Cleveland, averaging 1.3 PPG in 17.7 minutes per night. In addition to doing McCaw a favor, the Cavs wanted to open a roster spot to add point guard Cameron Payne, who signed a 10-day deal with the team yesterday. 5:24pm: The Cavs have officially waived McCaw, according to a press release from the club. 3:35pm: The Cavaliers are planning to waive guard Patrick McCaw, tweets Shams Charania of The Athletic. McCaw signed a non-guaranteed two-year, $6MM offer sheet with the team in restricted free agency, appearing in just three games. 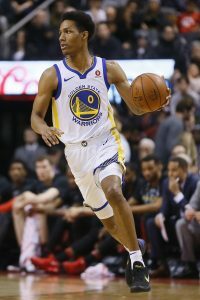 Several playoff contenders are expected to express interest in McCaw, according to Charania, who adds that Cleveland will also be interested once he reaches free agency. The move allows McCaw to enter unrestricted free agency once he clears waivers in 48 hours, although there’s an outside chance he gets claimed on waivers by the end of Sunday, Marc J. Spears of ESPN’s The Undefeated reports (Twitter link). McCaw, 23, appeared in 57 contests with the Warriors last season as a reserve guard. He held per-game averages of four points, 1.4 rebounds and 1.4 assists while shooting 41% from the floor. Golden State traded for McCaw during the 2016 NBA Draft, beginning his two-season run with the team.